the facet-term underlying structure is changed, with its classes trying to follow the Model-View-Controller architectural pattern; in this way, it should be easier to add new facets or new views, with less code involved. Please notice that this may not be the final structure: some discussions are happening right now about this, so things may change soon. Just a reminder: Sembrowser is a (very poor) clone of Dolphin, and it is not meant to substitute the default KDE file browser: it is being developed for testing faceted browsing of Nepomuk metadata applied directly to file browsing; the side panel offering this new functionality may (hopefully) someday be ported to Dolphin itself (or to some other Nepomuk apps). So, do not complain about missing functionalities (for the manager part), because I have just added the most important ones, but they are not the main goal here. Here in Politecnico the exam session is starting right now, so the next month will be a little busy for me; fortunately, by the end of july I should have finished all of my exams, so I should have some more time to dedicate to KDE (especially if some things will get realized as I wish, but more on this later). Sembrowser 0.2 is out for testing! 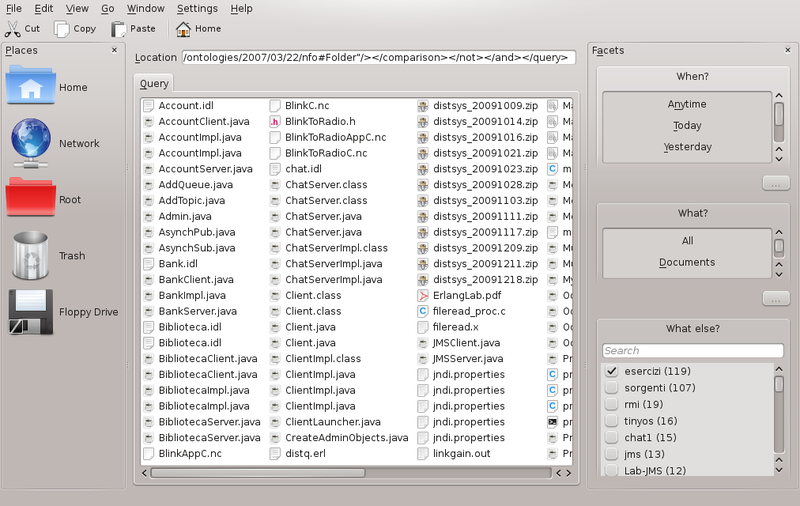 Several weeks are passed from the 0.1 version, so it was time to release the new version; before getting into a few details, let me remind you that this is not a substitute for Dolphin, but simply a prototype for checking the capabilities of having a faceted browsing in a file manager; thus, it has not all the functionalities of Dolphin itself, but only those that I think are needed in a very simple manager. So, go to the KDE-Apps page and check it out, and then tell me what’s good and bad with it (only constructive comments, please, no rants!). P.S. : you can also get the source from Gitorious, or install it on Ubuntu (Karmic for now, Lucid in the weekend) from my PPA. I already have a TODO list for Sembrowser, so expect some new features soon; in the meantime I have added a small utility, which you can find in the misc/ subdirectory on Git, useful for testing the application itself: if you are like me, and you create detailed directory trees for your files, then with the Python script that I have added (which, by the way, has been also an interesting experiment with KDE bindings under Python) you can specify a directory (say: /home/user/Documents/University/Some course name) and all the files found under that directory will be tagged with each fragment of their path (or part of it, for example Documents, University and Some course name will be tags applied to all files under that path). Check the script options for a more precise usage example. This can be useful for having a bunch of tags automatically associated to some files, so you can then try Sembrowser itself having something to browse, if you don’t usually use tags. If you are using Ubuntu 9.10 (Karmic) and the Kubuntu Beta repository, you may have noticed that the release of 4.4 RC2 broke the PyKDE bindings, which were left at version 4.3.x; for (temporarily) solving the issue, I have rebuilt the 4.3.95 packages from Ubuntu 10.04 (Lucid) to Karmic, without any modifications, and you can find them on my PPA. I don’t know if the Beta PPA will provide the final 4.4.0 bindings, mine are just for the RC2 release. Please notice that they are absolutely not to be considered as stable or widely tested or any of this; they just Work For Me, and they may work for someone else, but I cannot guarantee anything on that. Just a brief update: for those who follow the development of Sembrowser, I did not write a single line of code after the release of 0.1, and that’s because I have been a little busy during the Christmas holidays, for a university homework with today as the deadline. Also, the winter exam session will start in a couple of weeks, so don’t expect big surprises for a while. Ladies and gentlemen, Sembrowser 0.1 is out for testing! Side notice 2: if you want to stay on the “bleeding edge”, you can get the sources from Gitorious. I am not here to talk about the little semantic browser thing, which I know all of you are expecting (and I promise a first test version of the app in the next few days, Christmas holidays should help in giving me some time to prepare it right); I’m here to discuss some impressions on the Microsoft Semantic Engine presentation. Yes, I said “Microsoft”, and I’d like to survive to that phrase, and no, I did not change to the dark side of computer science; it happened that, a couple of weeks ago, I was browsing the sessions of this year’s Professional Developers Conference, when I found this one, about a so-called “Microsoft Semantic Engine”: as a semantic maniac, I had to download the video and see what the “enemy” is preparing in this field, especially because I think that KDE is the first desktop environment to introduce semantics for its apps, and if a new player is coming into the field, then it’s good to see what he is doing. So, finally today I found some time to take a look at it, and here are some impressions. It looks like a technology introduced especially for business users, which is a good place to start: if the semantic desktop works (and here I’m talking about Nepomuk itself: Microsoft never used the term “semantic desktop”), it could really help Linux itself in becoming a business player heavier than how it is now. For evidencing even more the business aspect, they built their engine on a relational database, which is pretty shocking IMHO: yes, in this way you can integrate with data warehouses, but the underlying code is a hell if you do not use any of the semantic languages/engines/technologies and their facilities (RDF(S), OWL, Jena, Virtuoso, Pellet). Triples, anyone? The crawling part is quite straightforward: each document is analyzed many times, at different levels, for getting keywords or other meaningful informations; there is an OCR part for images, as Scribo does, and a really interesting audio analyzer, which tries to extract also the tempo and the key from the music (if it is a music audio file, of course), and that’s really interesting from a technical point of view, at least for a musician like me. In the end it has been an interesting video, with some really interesting informations on how other software vendors are dealing with the semantic technologies; I think we (as KDE) have a great advantage on these “competitors” in this field, and we need to keep up the good work and integrate Nepomuk more and more into all the applications: the future is coming, and we are right on the bleeding edge.